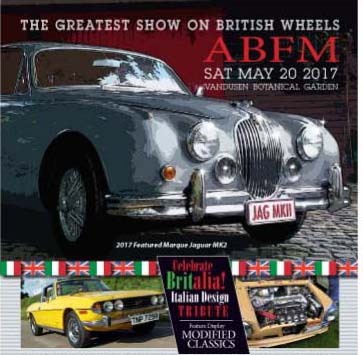 Dubbed The Greatest Show on British Wheels—the Vancouver All British Field Meet (ABFM 2017)—celebrating 32 years will make its way to the magnificent VanDusen Botanical Garden venue on the appropriate Victoria Day weekend—Saturday May 20, 2017—where the largest collection of 500-plus British-built classic cars and motorcycles will be displayed in 62 classes to the general public. The world’s first Sports Sedan, Jaguar Mk 1 & 2 models, will star in the 2017 Featured Marque display and younger enthusiasts will want to check out the special Featured Display of highly Modified Brit cars. Young enthusiasts will also play an important role in deciding the winners of the annual BCIT/NASKARZ Student Judging Award. For the first time, the event will recognize and focus on Automotive Design, with a specially invited 12-car grand display of Italian designed, British–built classics, aptly titled as Britalia. Expect to be both surprised and enlightened by the back stories accompanying this feature automotive display. The world-class VanDusen Botanical Garden venue provides a magnificent setting for this annual spectacle of awe-inspiring classics, complemented by food trucks, parts vendors, musical entertainment, classics for sale and Dealer future-classic displays. With 500-plus entrant vehicles and more than 5,000 enthusiasts in attendance, this event is the largest classic car event of its kind in Western Canada and the second largest in the Pacific Northwest. If you own a British Car or motorcycle in any condition, why not display it and enjoy the opportunity to meet and share stories with fellow classic car enthusiasts and also have the chance to be recognized with an award, or win a trip and other valuable prizes. For the attending General Public, take a trip down memory lane, talk to the owners, browse the vendor stands, enjoy food truck offerings and tunes from the resident brass band or take home your very own classic car from the on-site Classic Car Corral. Your entrance ticket qualifies for the grand prize draw for a Trip for Two. Click here for Media and Sponsorship/vendor information or to enter your classic for sale in the Car Corral please contact: Patrick Stewart pstewart@westerndriver.com TEL: 604 644 9067.